I trust as you read about this man you will know His God and appreciate his great service to our nation. Elder John Leland led Virginia in the charge for “The Bill of Rights” which guarantees us the Freedom of Religion, The Press, The Right to Bear arms, etc. With John Leland’s endorsement and leadership, Virginians sent James Madison to Congress with the promise, which he kept, to include a Bill of Rights in the Constitution of The United States of America. God, in His providence, blessed Virginia and our nation with this man and his ministry! About Elder John Leland, the man . . .
John Leland was born in Grafton, Massachusetts, on the 14th of May, 1754. God led him to Virginia to serve Him in that great time period of Revolution and Revival. John Leland experienced both during his years in Virginia. God sent a great awakening to repentance and righteousness during the 1780′s. John Leland testifies of riding throughout Virginia during that period of time and hearing the praises of God being sung jubilantly by the redeemed throughout the farm fields as he rode on his horse to preaching engagements. 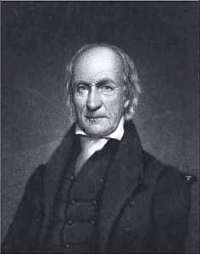 Elder John Leland was used of God in the formation of the Bill of Rights in the United States Constitution. Without his influence upon men such as James Madison, we may very well not have such a document today. He continued to voice his opinion about government and politics throughout his entire life until the Lord took him home to Heaven. Leland was very close friends with James Madison, Thomas Jefferson and James Monroe – all Virginians who lived in the central part of Virginia where John Leland resided. John Leland was called of God to preach His Word. Leland was a preacher who preached in an expositional manner. He also wrote hymns, poetry, and many wise sayings. Later in life he was asked by the people to serve as a representative in the Massachusetts legislature. After spending 14 years in Virginia, John Leland and his family packed up and moved north to Massachusetts to continue on for the Lord in the pastoral ministry near his home area. Rev. Leland preached his final sermon the evening of January 8, 1841 in North Adams, Massachusetts. Leland was not one who often wrote out his sermons. He studied the Word and preached from it what God had placed upon his heart. This final message was preached from I John 2:20 & 27, verses that speak about the working of the Holy Spirit in the life of those who have placed their faith in the Lord Jesus Christ for the salvation of their soul. Leland exposited the Word of God in a clear and understandable manner. Later that evening after his prayer time a noise was heard in his room and Rev. Leland was found laying prostrate on the floor and feeling very ill.
Leland, ever ready to preach the Word in season and out of season, by God’s grace was ready to do what the Lord had called and enabled him to do just hours before his home going! The Lord took this dear man into His presence that evening, January 14, 1841. Just six days after he had preached his last message. “Thus died John Leland—a man eminent above many for piety and usefulness, whose name is connected with all that is pure in patriotism, lovely in the social and domestic virtues, philanthropic in feeling and action, arduous, disinterested, and self-denying in the labors of the ministerial calling; one whose place in society, in the church, and in the ranks of the ministry, will not soon be filled — in the hearts of those who knew him — never.” What a testimony this man had among those with who he lived! Is this not so reminiscent of the words of John the Baptist, “He must increase, I must decrease.” Indeed, how we also should take heed to this example and the admonition of the Bible to have “the mind of Christ” in humbling ourselves and not thinking of ourselves more highly than we ought to think. May it be so in us! So I will endeavor, through this website and my impersonation/interpretations, and if should we have the privilege of meeting, to let you read his writings on this site and hear me in person what John Leland would speak as I impersonate this man of God. From my heart I would tell you that this man’s life has been a great blessing, encouragement and most of all, a Godly example to me. It is for this reason that I seek to make the ministry of this man known, but most of all, that you would know our Savior, The Lord Jesus Christ! It is a most humbling thing to be called of God to preach His Word in the 21st Century. May God find us “holding fast the faithful Word” when Jesus comes or calls us home to Heaven! Unless otherwise noted, the words and information about John Leland on this web site are found in the book, “The Writings of the late Elder John Leland,” by Miss L. F. Greene, Lanesboro, Massachusetts.